That’s right, rap lyrics in Hindi/Punjabi. No flashy cars, no long legs. Just angst against the establishment, a voice raised against a piece of legislation which is witnessing protests across an entire region of India. A voice against corruption and scams. A cry that the country is lost. Zoya Akhtar’s eagerly-awaited Gully Boy releases this week, promising to be the coming-of-age of rap music in India. But far beyond Gully Boy, there has existed an underground music scene that has stayed true to the anti-oppression roots of rap and even metal music. This election season, it is this underground scene that is coming-of-age, thanks to some young artistes who recognise these forms for what they are — the voice of the people. The lyrics quoted above were written and performed by the Kolkata-based trio Adiacot, as part of their song Bike huey hain sab. But listen to another song by the same trio, and it’s not all criticism of the BJP government at the Centre or in Assam. In Bik gayi hai gormint, Adiacot doesn’t shy away from accusing West Bengal Chief Minister Mamata Banerjee of being a sell-out, hitting out at her Trinamool Congress party and government for the Majerhat bridge collapse in Kolkata that killed three people and the chit fund scams that cheated common people of their hard-earned money. “Our raps are mainly focused on social issues, because we want to spread a certain level of awareness and start a movement. We are not afraid to take names,” says Adiacot’s 29-year-old lead rapper Santhanam Srinivasan Iyer, a.k.a. EPR, who is also part of another rock band and has been in the music industry for over a decade. He is showing the ropes to two 20-year-olds from Shillong, Hulkyboyy and El Deepo, who are currently pursuing their studies in Kolkata but all compose raps. Adiacot is not alone. Acts like Tamil Nadu’s Sofia Ashraf (Kodaikanal won’t) and Odisha’s Samir Rishu Mohanty a.k.a. 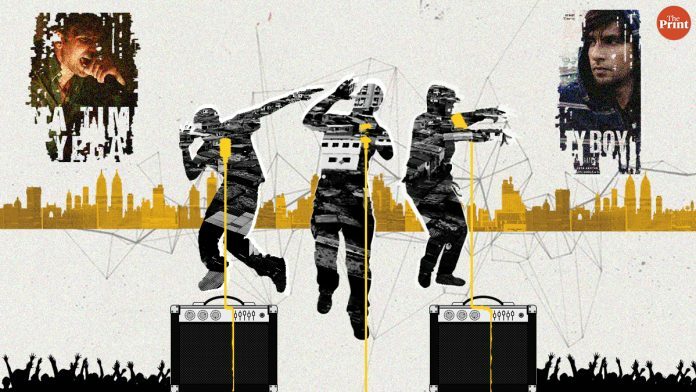 Big Deal are taking Indian rap beyond the Honey Singhs and Badshahs, and back to the origins of the form in 1970s America, which carried ‘politically and socially conscious messages’ according to the Harvard Political Review. Oxford’s Research Encyclopedia, meanwhile, says it emerged as a response to the racism, poverty, urban renewal, de-industrialisation, and inner-city violence in New York City. Metal music, with its distorted guitars and amplifiers, thrashy drums and growly vocals, has a much more limited but far more dedicated following on the underground scene. And while unlike rap, this form has hardly ever made it to the mainstream, it is an even more apt platform for the banner of protest to be raised. Heathen Beast is an anonymous metal band that is doing particularly provocative work, on a range of issues from demonetisation to Sabarimala to Ayodhya. “Why should we be silent spectators to injustices in the world? Sometimes we cannot physically do things, but we can speak about them, we can sing about them. When has caring about people become controversial? When did murder and discrimination become OK?” Heathen Beast wrote to ThePrint. The band was established in 2012, with members spread out over the country and abroad, and holding regular day-jobs like advertising and financial management. But it says the “rise of Hindu terrorism and the saffron brigade”, and “the fact that we have never seen more religious intolerance, and never in such a brash, fearless fashion” prompted it to shift its stance from anti-religion to a “war against arm-chair patriots who are creating havoc in society”. Heathen Beast’s stance is clearly anti-BJP/RSS — the band invokes the ghosts of 2002 to “expose” them for sowing seeds of hate and misguiding the youth. Like the rappers, Heathen Beast’s music also harks back to the roots of metal music as an outlet for the angst of the white working class. “The sound of metal goes with the message being spread. To represent the horrors of war, metal is the perfect medium. You need it to sonically convey the horror and hate,” says Nilabja Banerjee, frontman of now-defunct metal band Deadbolt India, who sang of Kolkata being a City of Rot. Big Deal is a prime example of how not all creative expression needs to be anti-establishment. He calls rap the ‘people’s genre’, and the mass appeal he has found among the youth is an illustration of that. “I feel rap is more people-oriented. It lets you say so much. And I don’t always need to be politically correct,” says the 28-year-old, who rose to fame with Are you Indian? , a song based on racism against the Northeast. Big Deal often uses his lyrics to praise Naveen Patnaik’s 20-year government in Odisha. “Why should Odisha always be shown as backward and never at par with cities like Benglauru and Hyderabad? There has been development in the state and I saw it after going back to the state after 16 years,” he said. His song Khusi Ta highlights several of Patnaik’s trademark schemes like providing rice grains at Re 1, free medical treatment and the Skilled in Odisha mission of the government to provide technical and vocational training to its youth. The fact that these forms of music are now gaining traction among the masses thanks to the internet and social media has made political parties sit up and take notice too. The recent social media video exchange between the ruling Bharatiya Janata Party and opposition Congress based on Gully Boy’s song Azadi showed that this election season is about more than just sloganeering -— and that rap music in particular could play a big part in making political statements. And while many might see Gully Boy as an attempt by big brother Bollywood to appropriate a ‘guerrilla’ underground forms, Adiacot’s Srinivasan admits that it will help mainstream their music too. “A Bollywood boost will help the hip hop scene in India greatly. It will be a push forward — both for rappers who sing about fancy cars and for rappers like us who want to start a movement,” he says. Sofia Ashraf and Big Deal appeared at different editions of ThePrint’s Democracy Wall event in 2018. You can see the videos here and here.